This week’s Triple Shot focuses on big dumb superhero action with more than one Daredevil and an unfinished script from Andy Diggle over at Action Comics #21 only a week before the highly anticipated release of Man of Steel. Marvel’s Daredevil—The Man Without Fear. The alter-ego of blind lawyer Matt Murdock can tell us a lot about what we take advantage of in life as he faces loss constantly through his life. Writers from Miller to Bendis to Diggle skewed his character to the dark brooding Hell’s Kitchen son of a prize fighter and enemy of the Kingpin since the ‘80s. 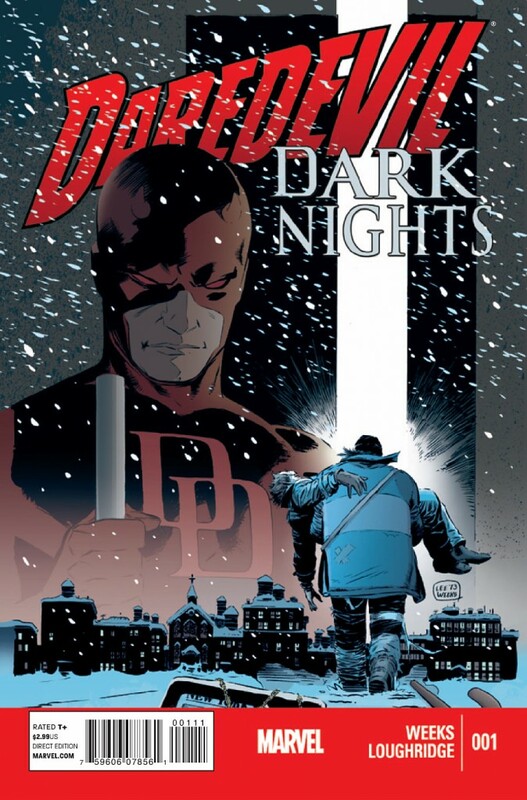 Recently, we’ve praised Mark Waid’s serious but brighter take on Daredevil in his current Eisner Award winning run. We’ve also mentioned Daredevil: End of Days, a future tale written by a super-team of Brian Michael Bendis and David Mack best compared to Dark Knight Returns. The final issue of End of Days also ships this week, to be reviewed later when the collected edition hits. Daredevil: Dark Knights is an anthology mini-series with more of the great Marvel creators taking a shot at our red-horned attorney. Penciler Lee Weeks returns to the title by writing and drawing the first three issues of this anthology (his is the only story in each of these books). Snow replaces rain in this book as the natural enemy and backdrop for this story. As Matt awakes as a John Doe in the hospital when he awakes from his concussive state to hear a mugging in the emergency room. The hospital has become shelter for many desperate to escape the snow. Daredevil’s sensitive hearing makes him aware of a little girl’s heart transplant being delayed by a helicopter flight. He leaves to assist, but may be too late. If this was the Daredevil book on the shelves monthly right now, it would also be winning Eisners. 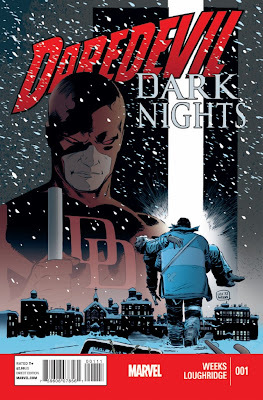 This is more of a classic superhero story than we are used to in comics today, but with a thick meaty story and no romantic overtures, we have ourselves a great companion limited series to the Mark Waid book, Daredevil fans will be quite pleased. Movie tie in? No! We wish. This issue is transitional between the departure of writer Andy Diggle (who left for unrevealed reasons) and our favorite Bat-Artist Tony S. Daniel taking over both the writing and art duties for the book. I have to say, this worked to the advantage of the overall story and completion of the Hybrid story arc, started after Grant Morrison left the title after issue #18. 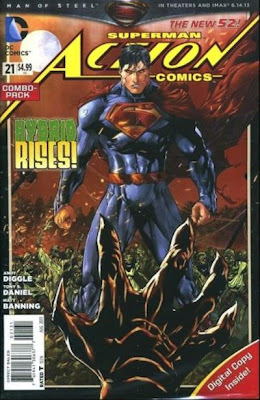 Diggle and Daniel brought this to a more traditional Superman story, focusing on saving Metropolis, his relationship with Lois and Jimmy rather than the quite awesome but intentionally confusing Mr. Mxyzptlk and origin story buildup of the Morrison run. Superstar artist Tony S. Daniel has impressive writing credits, having written Batman: Battle For The Cowl, Batman, and most recently The New 52 Detective Comics. It is no surprise that DC trusts him with the ‘other’ flagship book and character now. One can pick up this issue (without reading #19 or #20) to find this. 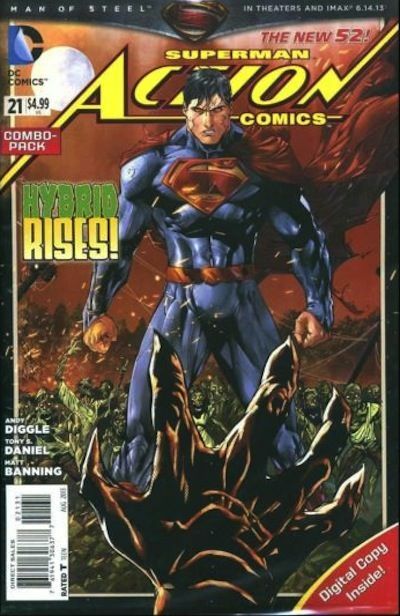 Superman defeats big dumb Hybrid monster that consists of citizens of Metropolis. Lex Luthor suits up in The New 52 version of his Warsuit. Punching. Superman is weakened. Superman flies toward the sun to gain strength. Superman socks Luthor. Lois loses cell phone video documenting the fight. Clark returns cell phone, says he watched from sideline. Lois’ date Jon Carroll shows up. Jimmy cracks a joke. The End. Thank you, Mr. Daniel (and Mr. Diggle) for delivering what I needed. The doctor prescribed two punches to Lex Luthor and no magic. A simple, incredibly drawn Action Comics issue practically had me in tears with it’s celebration of superhero storytelling. The Image Revolution was just yesterday, right? I think Erik Larsen just took over for McFarlane on Amazing Spider-Man only last year. Ugh! It has been so long, though since those halcyon days. Now, we can follow Erik Larsen on Facebook to watch his coloring and logo design process months before the book hits the shelves. I like to check in on Savage Dragon every once in a blue moon — if only to say, “Yup, dude’s still got it”! Issue #200 isn’t too far away at this point. I won’t even start on what’s happening plot-wise here, my ignorance of the Dragonverse would doom me to mockery on message boards across the world. 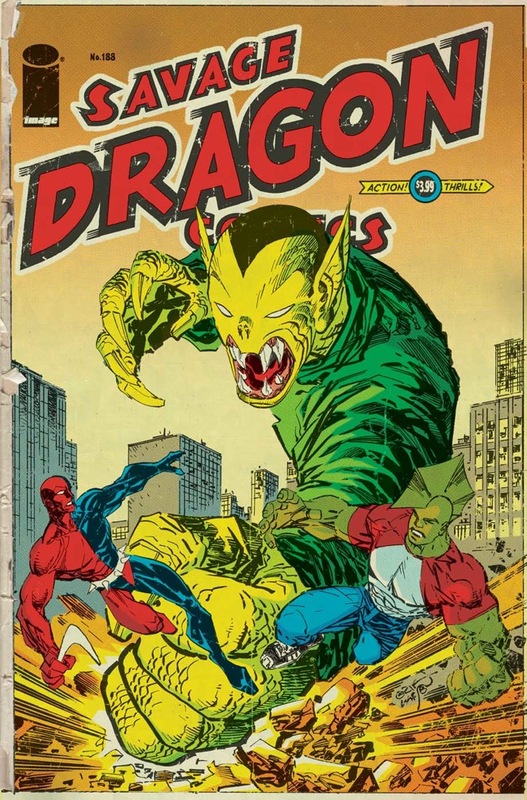 Dragon is being sentenced for murder, and meanwhile Daredevil (Golden Age!) 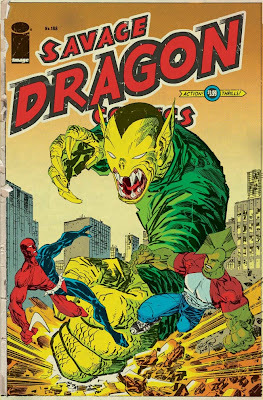 and Dragon’s son Malcolm take on Golden Age villain The Claw and his flying monkey men. Lots happens here, we’ll avoid the spoilers, but consider picking this book up to see that dude has still got it. He’s practically Jack Kirby reincarnated. Also, the cover is way cool, faux-aged like a dog eared copy of Tales of Suspense on the hopper in the barber shop!